The 100-150 sqm ground floor air-conditioned villa is available in king or twin bed configuration overlooking an outdoor patio and private swimming pool. 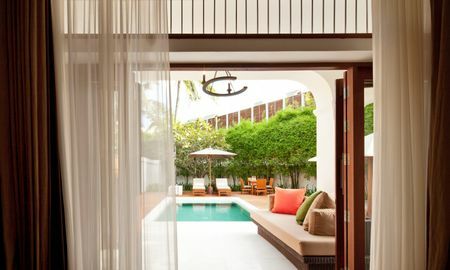 The open-air bathroom has a full size bathtub situated in a beautiful garden, and the outdoor rain shower leads to the backyard swimming area. Additional features include a 26" flat screen television, home entertainment unit and complimentary wireless internet. Upon entering the villa through a private gateway, guests suddenly find themselves surrounded by lush gardens, a relaxing outdoor daybed, and a stunning 3m x 4m swimming pool with 2 sun loungers. The luxurious air-conditioned bedroom is well appointed, including a full size daybed. 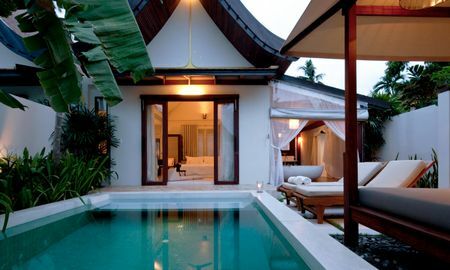 The bathroom is open-air, with bathtub and outdoor rain shower, and is surrounded by colorful tropical gardens. Nestled alongside Koh Samui’s Choeng Mon Beach, SALA Samui welcomes you with a large range of facilities. It has exceptional and luminous Villas, which contain a perfect configuration overlooking outdoor patios, gorgeous garden areas and large swimming pools. Some also offer an open-air bathroom set with a highlight on a separate bathtub and a splendid outdoor shower. The SALA Samui restaurant astounds its guests with its incredible range of International and Thai delights. Savour mouth-watering dishes just meters away from the lapping shores of Choengmon Beach, or Italian favorites at the PANGAEA. The cozy and comfortable open air bar which serves cold beers, refreshing cocktails and a great selection of International wines, it is the perfect spot to let go of the stress. Tea lovers will be pleased to know that a choice of premium Dilmah tea is available daily along with delicious snacks. Take a dip in the pool and get exhalted by the magnificent greenery scene. Feel the instant rejuvenation upon entering the SPA and surrender for an exquisite moment. Enjoy a typical Thai massage and let the meditational silence get to all of your senses. SALA Samui Choengmon Beach is a 10-minute drive from the Airport and less than 1 km from Choeng Mon Beach. Any child between 4 and 11 years old stays for THB 575.00 per person per night to sleep in an existing bed. Upon check-in and check-out, guests must present the credit card used to secure your reservation.